In all our room categories free Wi-Fi internet access is included. 90% of our rooms are non-smoking rooms. Entertainment is provided by a 22 “LCD TV with numerous German and international TV and radio channels. New soundproof windows with blackout curtains provide comfortable sleep. Our executive rooms additionally offer more space and a convertible sofa which can be turned into a sleeping accommodation for a second person. 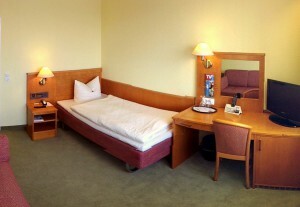 Entertainment is provided by a 26 “LCD TV with numerous German and international TV and radio channels. 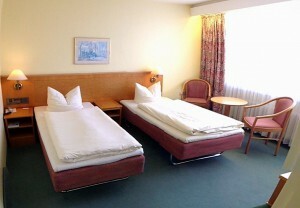 Have yourself a spacious double room for you all alone! Double or twin bed room with extra bed. We provide free baby cots, children up to 10 years sleep free of charge in the parents’ bed.